All pieces of property in the list are new-build apartments developed and constructed by Metrodom. The list of apartments can be ordered according to the ID number, size and price of the apartment. The list can be saved in PDF format, sent by email or printed by clicking on the icon in the upper-right corner. By clicking on the ID number of the apartment you can open the layout plan and toggle between the technical layout and the furnished visual layout format. At the end of the row you can click on the 3D icon, if available, and open, move around and magnify the 3D model of the apartment (loading may take 3-10 seconds depending on the speed of your internet connection). The Family Housing Support Program (CSOK) is available to purchase these apartment units, click on the 'CSOK' sign to see the amount of the subsidy available. If the apartment also has special features, you can see them by clicking on the 'Info' sign. Our handed-over buildings and references you can find, here. 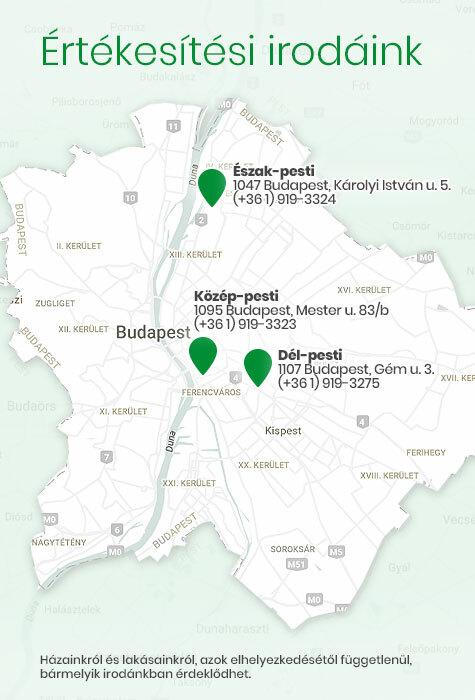 Euro prices on our website are derived from the HUF prices, calculated on the basis of the average EUR-HUF exchange rate of the Central Bank of Hungary. The price is defined in HUF in the contracts and is to be transferred to our HUF account. In case of EUR transfers, the bank will automatically convert EUR to HUF using their actual daily exchange rate. Prices are gross prices inclusive of the VAT calculated using the VAT rate applicable at the time of concluding the contract. In the contract however, only the net purchase price is indicated. Prices include legal fees and those of land registry procedures. No additional fees on top of the quoted purchase price are payable to Metrodom, under any title whatsoever. Net prices are non-negotiable, preferential prices or additional discounts may only be given to the extent our publicly advertised special deals allow. Apartment trade-ins, barters or any other alternative payment arrangements are not allowed. Advertised prices are non-binding and do not constitute contractual obligations on the part of Metrodom. Prices may be modified unannounced and without prior notification. Please be aware that pursuant to the stipulations of Act LXXXII/2018 amending VAT legislation, all apartments on projects having received the final and legally binding building permit before November 1, 2018 (this applies to all apartments currently offered by Metrodom) will only be encumbered with 5% VAT regardless of the date of payment, i.e. the gross amount or installment payable by our customers will not increase after January 1, 2020. With regard to apartments (offered by other property developers) which had not received the final, legally binding building permit before November 1, 2018, payments made until December 31, 2019 will be encumbered with 5%, while those made after January 1, 2020 with 27% VAT. We do not store the email address. On a mobile device, use your fingers to rotate, tilt or magnify, if using a desktop computer or a laptop, please click and hold the mouse button to move the model around. I agree to send me information (eg start-up projects) as described in the Data Handling Notice. The consent can be withdrawn at any time.